The original post my friend found is here, but we made a few minor changes. These are sooo easy to make! The hardest part is staying within the lines of the candy canes, but even that is not too difficult. 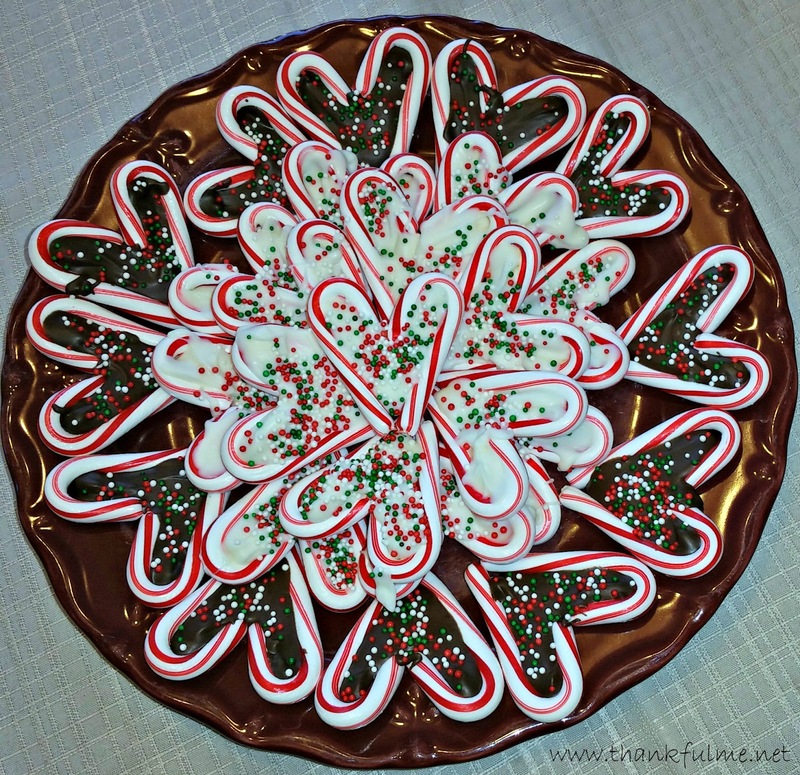 Arrange the candy canes on the waxed paper or baking mat to form hearts. Melt the almond bark according to package directions. (Zap a couple of squares in the microwave for about a minute and stir. If needed, microwave longer in 15 second increments.) Using a small spoon (I found I was most successful using a baby spoon), put the melted almond bark inside each heart. Sprinkle with sprinkles, and allow to cool. Within minutes, your hearts will be ready to eat! I'm thankful for quick, easy treat ideas, for pinterest, for friends, for Relief Society, and for Christmas! Thanks for the link and the tips. These would be fun to make. Those are so cute and they look delicious! One of my favorite things about Christmas is candy canes! Because I never seem to have enough to do (ha! ), I will probably try this in the next few days...I have to wait until closer to the last minute as each time my youngest son comes to visit, he steals a candy cane. I have a tree in the entrance and have replaced the candy canes three times! I love visiting you, I always leave with a smile on my face!